Everything's almost set for this year's HIMSS conference in Chicago. News of exhibitors, big and small, that have chosen to pull out of the exhibition has gotten a lot of play. Of the vendors that have pulled out that I follow, all are coming to the conference as attendees. 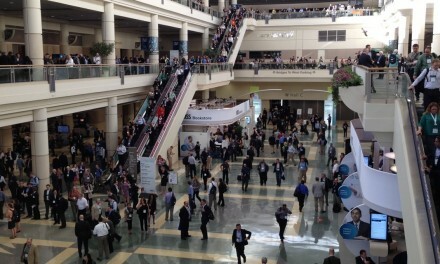 HIMSS reports that the number of total exhibitors is up a bit over last year. 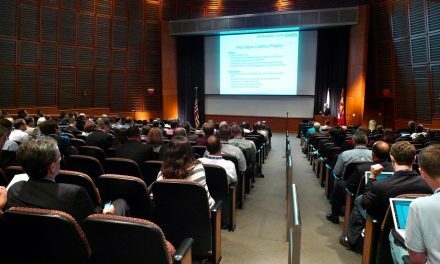 So it looks like HIMSS remains as relevant as ever -- not that I had any doubts. As always, I'll be blogging from the conference, and writing a HIMSS wrap-up story for Canon Communications. If you're interested in a story for your publication, let me know (contact info here). There seem to be an increase in new and interesting vendors this year. Just a few of the exhibitors that I'll be seeing for the first time include: point of care communications vendor Voalte, wireless sensor company KAI Sensors -- wireless and no-contact sounds intriguing, CaraFlow with an interesting in-room nurse automation solution, workflow automation vendor Mobile Matrix, some new distributed antenna system (DAS) vendors (Tri-Power, Cellular Specialties, and Cell Antenna - okay they only sort of qualify as a DAS, but interesting none the less), and a bunch of new wireless networking vendors -- from services (Scientel Wireless, Wantering WiFi and Presidio Networked Solutions) to infrastructure (Aerohive Networks, Fatpipe Networks and Ruckus Wireless). If I've missed anyone you think I should check out, you can drop me a line (my contact info is on the About page). If you want to meet up at HIMSS, you have two options. First, you can look at my calendar and request a meeting in advance. Be sure to note the timezones displayed on the left when proposing times -- on my calendar page, both Pacific (where I live) and Central times (the meeting location) are shown. Confirm which timezones are displayed on your page (you may see Central and your own time zone displayed). You may have noticed the new Twitter widget at the bottom of the this web page. I've been "twittering" for a few months now as a way to share interesting thoughts, things I'm thinking about, and as a form of abbreviated reportage. (No, I don't broadcast things like what I had for breakfast.) At HIMSS, I'll be twittering about public events (obviously, nothing private or confidential). I will also use Twitter to update my location for anyone that wants to meet up with me. You can also send me "tweets," the short 140 character messages supported by Twitter. You're encouraged to ask questions, suggest questions for vendors, suggest a time and place to meet up, or just say hi. If you're new to Twitter, you'll need to set up an account at their home page. Then you can visit my profile page and click "follow." HIMSS will also be twittering the conference. If you want to get fancy, you can scroll to the bottom of the Twitter web page and click search for "HIMSS09" to see all the conference related tweets. For the first time, HIMSS has officially recognized the blogger community. Since our first meeting at that Irish bar after the opening reception of HIMSS in San Diego, groups of like minded folks have meet to talk about blogging, the conference and the industry. This year, HIMSS has organized two Meet the Blogger sessions organized as round tables. Bloggers will be talking about, what else, blogging. The Meet the Bloggers roundtables will be Sunday at 4:15 to 4:45 and Tuesday at 4:45 to 5:30 at the HIMSS Tech Lab. The Tech Lab is located next to HIMSS Central in the Grand Concourse. I'm currently slated to participate in the Tuesday session, but will also try to come by on Sunday. There's also an interesting Tech Lab session, Social Networking 101 held Sunday, Monday and Tuesday (check the link above for times). HIMSS has also organized a "Tweetup" where one arranges a meeting through Twitter. This event is going to be at McCormick Place in Room s406a, Monday April 6 from 5:30-6:30 p.m. (shared with Communities Open House). You can register for this event here. Come by and say hello. 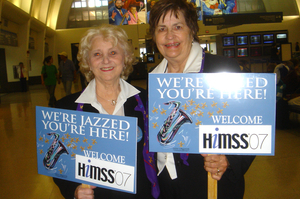 The photo above is of the charming HIMSS greeters in New Orleans (there was also a brass band in luggge claim at the airport). PreviousCan We Fix Wireless in Health Care? We’ve taken quite a number of videos of HIMSS09 and HIMSS10. There were quite a few differences between 09 and 10, with one of the major ones being the tens of billions of dollars of stimulus funding placed into the industry. For viewing the HIMSS videos from 2009 and 2010, please see http://www.ehrtv.com/category/tradeshows/himss09/ or http://www.ehrtv.com/category/tradeshows/himss10/ respectively. I for one can’t wait to see what is in store for HIMSS11.